It just wouldn't be Christmas with out some crafty gifts. This years big gift was for D's nephew. Joe is 9 and wants to take drum lessons from his wonderfully talented drummer uncle :) So for Christmas, D thought it would be a good gift to restore his first snare drum for his nephew. 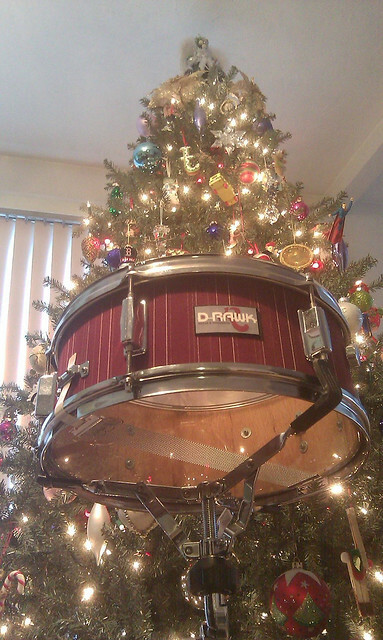 Since the drum was so old, it had some massive cosmetic issues. At first thought, we were going to just sand out all the imperfections and paint. But once we removed all the hardware it looked like a harder task than anticipated. A new idea was born and we headed to the fabric store. We picked out a fabric that was simple yet fun. 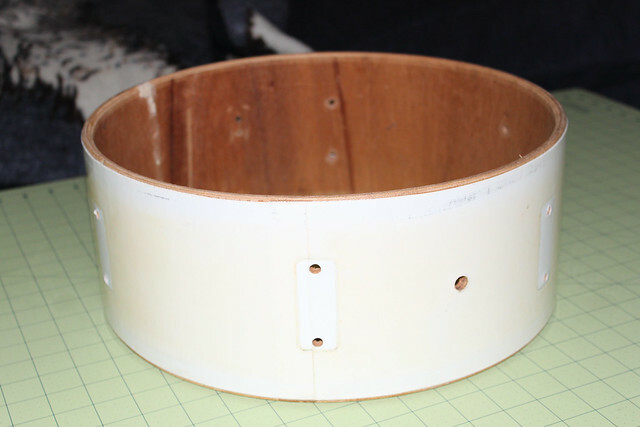 Once D sanded the drum as much as he could, and took off all of the original logo plates, I used Heat'n Bond to adhere the fabric to the drum. I have used Heat'n Bond before to adhere fabric to furniture with great success. It is a great product. You iron the thermoweb onto the fabric, peel the paper off the back and then iron the fabric to your object. This time around it was a bit harder. For what ever reason, not sure if it was the fabric or the curve of the drum, the Heat'n Bond did not quite stick to all areas. We had to use glue for some areas that would not bond (mostly around the edges). That said, you would never know we had any problems because once D put the heads and all the hardware on the drum, it looked great. 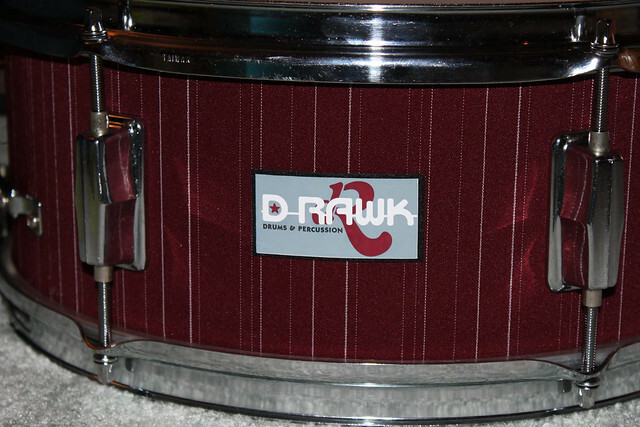 If you know D, you know that he loves "custom" stuff, so of course we had to finish the project by adding a custom "D-Rawk" patch to the front of the drum where the old logo plate use to sit. For the patch, we simply printed out his logo on iron on transfer paper for dark clothing. 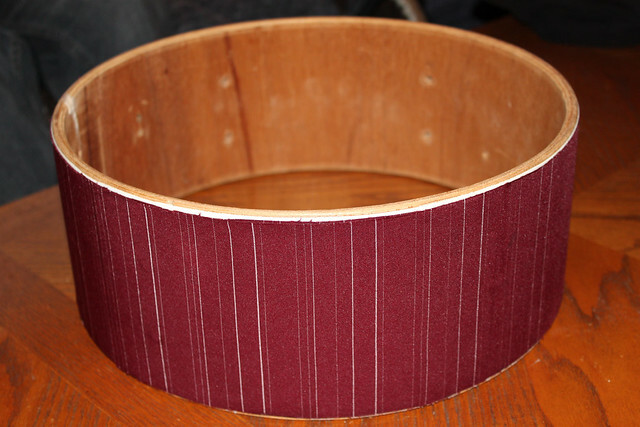 We ironed the transfer onto stiffened felt, and glued the felt to the front of the drum. It looked perfect! This project was a great learning experience for both D and I. And Joe loved his gift, so all the better. Hope you all had a happy holiday and I wish you a happy new year!